In the early 1920s a researcher spent his days watching vortexes in water circle around each other. A hundred years later, we do the same thing—but we do it from space as we wonder which way a tropical storm is going to go. Sakuhei Fujiwhara was a Japanese meteorologist who ended up being on the wrong side of the greatest political struggle of the 20th century—World War II. His knowledge of weather patterns caused his government to recruit him in the drive to make a weapon powered by only the weather. He helped develop the fire balloon, balloons with bombs attached to them that floated across the Pacific Ocean to randomly bomb the mainland United States. After the war was over, he lost his academic position and retired to a quiet, rural life of study and occasional teaching. The balloon might have been his legacy, if it weren’t for his early academic career. In the 1920s, when the world was getting over the last global war, he traveled to Norway. There he spent his time observing whirlpools in water. He was the first to describe how two vortices, when they got close to each other, circled around some central point, like orbiting planets. If they got too close together, they fell into each other. His work was well-received, but it was only until much later that we got to see it applied on a grander scale. 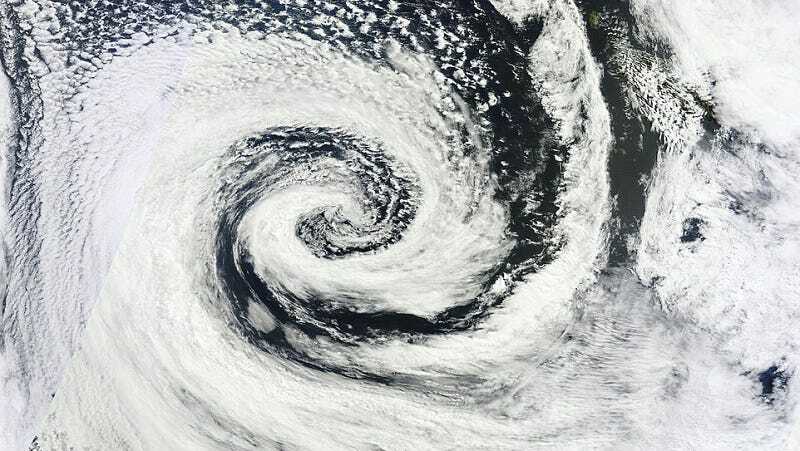 Meteorologists often observe the Fujiwhara Effect when two cyclones get within about 1200 kilometers of each other. The two will change direction, circling around each other like dancers. Sometimes they can merge, but more often they head off in new directions after their brief spin. The Fujiwhara Effect fascinates amateur weather-watchers and professional meteorologists alike. The scientists are still studying the intricacies and exceptions to the effect. The amateurs content themselves with watching Fujiwhara’s legacy written across huge sections of the globe.